The 2013 AGM was attended by 30 members, the most for many years. The minutes, Chairman’s Report, Trustees Report, Accounts and Membership Secretary’s Report are all available here and will be part of the summer newsletter. The Centenary ‘black tie’ Dinner was attended by 62 members and guests. They were treated to a most warm and heartfelt talk from our Guest of Honour, Dame Felicity Lott and wonderful entertainment from Richard Suart and Bryan Evans. Those present raised a glass to toast the next 100 years of the Association. The Trustees’ Report & Accounts may be found here. The Membership Secretary’s Report may be found here. This entry was posted in Past Events on March 17, 2013 by AESS. The final of the 2013 Courtney Kenny Award was held at Tonbridge School on Sunday 10th March. Thanks are due to the Facilities Department, the porters and the catering staff of the school for their help. Seven finalists had been selected from a very strong field the previous week by Eileen Price, Jonathan Courage and Stephen Miles. Thanks to them and to Judy Hildesley for providing her wonderful music room for the event. The panel for the final was Courtney Kenny, Jonathan Courage and AESS Chairman, Graham Trew. 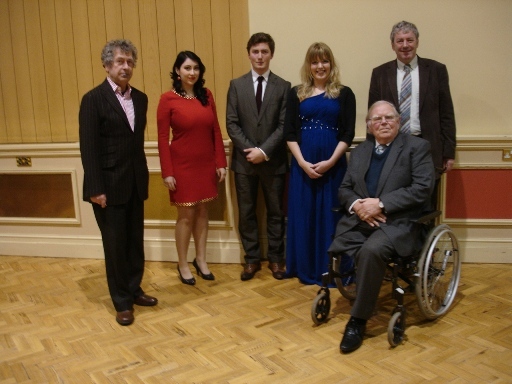 The winner of the £1000 first prize was Sinéad O’Kelly, a student of Russell Smythe at the Royal College of Music. Her theme was ‘Unrequited Love’. The runner-up was Dominic Sedgwick, a student of Robert Dean, soon to begin studies at the Guildhall School of Music and Drama. He won £500 with a recital entitled ‘ A ploughboy’s war’ as did third placed Alexandra Stenson, who studies with John Evans at the Guildhall. Her programme was called ‘Tell me the truth about love.’ The winning accompanist (£500) was Ian Tindale. Left to Right: Jonathan Courage, Alexandra Stenson, Dominic Sedgwick, Sinéad O’Kelly, Graham Trew and Courtney Kenny. This entry was posted in Past Events on March 10, 2013 by AESS. 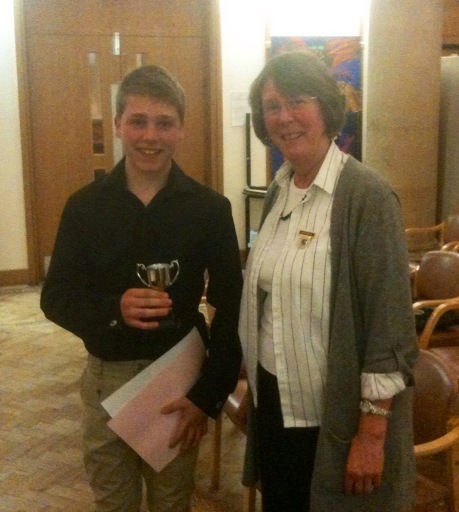 The AESS Centenary Cup was awarded to 14 year old Benedict Munden on the 9th of March at the Richmond upon Thames Performing Arts Festival. He introduced his ten minute programme citing ‘Nature’ as his theme. He sang the Handel/Somervell Silent Worship, The Lark in the Clear Air arr. Phillis Tate and recited the poem, Mushrooms, by Sylvia Plath. Benedict Munden with AESS Honorary Secretary, Judy Hildesley. This entry was posted in Past Events on March 9, 2013 by AESS.